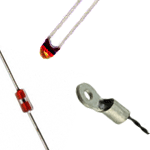 A thermistor is a temperature sensitive resistor, they are often used as a temperature sensor. The term thermistor is a contraction of the words “thermal” and “resistor”. All resistors have some dependency on temperature, which is described by their temperature coefficient. In most cases for (fixed or variable) resistors the temperature coefficient is minimized, but in the case of thermistors a high coefficient is achieved. Unlike most other resistors, thermistors usually have negative temperature coefficients (NTC) which means the resistance decreases as the temperature increases. These types are called NTC thermistors. Thermal resistors with a positive temperature coefficient are called PTC thermistors (Positive Temperature Coefficient). 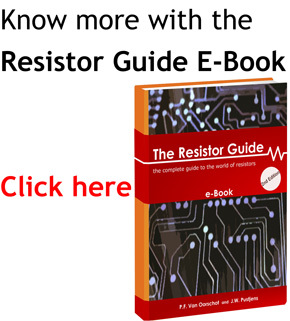 A resistor whose resistance changes significantly with a change in temperature. Thermistors are ceramic semiconductors. In most cases they are composed of metal oxides, which are dried and sintered to obtain the desired form factor. The types of oxides and additives determine their characteristic behavior. For NTC’s cobalt, nickel, iron, copper or manganese are common oxides. For PTC’s barium, strontium or lead titanates are commonly used. The NTC type is used when a change in resistance over a wide temperature range is required. They are often used as temperature sensors in the range of -55°C to 200°C, although they can be produced to measure much lower of higher temperatures. Their popularity can be accounted to their quick response, reliability, robustness and low price. The PTC type used when a sudden change in resistance at a certain temperature is required. They exhibit a sudden increase in resistance above a defined temperature, called the switch, transition of “Curie” temperature. The most common switching temperatures are in the range of 60°C to 120°C. They are often used for self-regulating heating elements and self-resetting over-current protection. Several package types and sized are available, the radial leaded type is the most common and mostly constructed from epoxy. For applications in harsh environments, glass encapsulated packages are more suitable. Integrated packages are also available, such as threaded housings, lugs or probes for easy mounting. The following table shows some examples of available package types. The following symbols are used according to the IEC standard.